Matt Henderson donated to the Carry On Campaign with these words: "No real essay to commission, but I will gently nudge you into considering a Malick retrospective". Absolutely no nudge was necessary: I've been planning on doing this ever since the day The Tree of Life was announced. Still, I'm glad to dedicate the following week in Matt's name. In January, 1958, 19-year-old Charles Starkweather and his 14-year-old girlfriend Caril Ann Fugate, both of Lincoln, Nebraska, went on a murder spree that began with the death of Fugate's mother, stepfather, and baby sister, and ended with Starkweather's execution by electric chair and Fugate's imprisonment for 17 years. 15 years later, a movie came out inspired by the couple's one-week rampage, titled Badlands. Superficially, this film fits securely into the chain of glamorous period killer/lovers that cropped up in the wake of Bonnie and Clyde in 1967; but Badlands is hardly an ordinary movie. And the man who wrote and directed it is hardly an ordinary filmmaker. The career of Terrence Malick did not begin in cinema, but in philosophy; a Harvard philosophy student, he had published a translation of Heidegger under the title The Essence of Reasons by age 26, was teaching philosophy at MIT not terribly long after that, was an essayist, a graduate of the American Film Institute, a personal acquaintance of Jack Nicholson (whose directorial debut, Drive, He Said, boasted an uncredited rewrite by Malick). In the forty years of Malick's career, he has achieved the status of living legend, fueled in large part by the stunning 20-year break he took between his second and third features, as well as the counter-intuitive way in which he directs his actors and the sprawling - one might say messy - manner in which he pulls his completed films from an undifferentiated mass of raw footage. In 1973, though, Malick was still just a filmmaker, with one student short under his belt and a couple of screenplays, and when Badlands was released, it was not accompanied by the gongs of an Event, like all of his subsequent features have been. It was just a movie; though a rapturously-received movie, and if I may say so myself, one of the greatest movies ever made (in fact, I did say so). Before I go any further, I'd like to pause a second: Malick's films, if you have not yet had the privilege of seeing one yourself, are incredibly dense: at their easiest, these are still among the most complex films ever released by mainstream American studios, both formally (the pictorially exquisite, informational-laden cinematography; the massively unconventional editing schemes) and thematically (because when you translate Heidegger in your mid-20s, it's going to show up in your movies). One must of necessity pick and choose what one is going to say about these films, and I'm going to concede up front that some of the richest threads that one could pursue are just going to be too much for me to handle. Simply in the interest of keeping things manageable, I'm not going to spend too much time talking about the influences on display in Malick's cinema, preferring instead to let the movies speak for themselves, as cinematic objects & not the pronouncements of one of the greatest Renaissance men of modern filmmaking. Unpause. 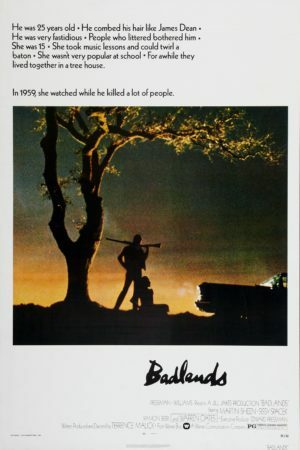 Badlands tells the story of 15-year-old Holly Sargis (Sissy Spacek, in her breakout role), transplanted from Texas to South Dakota on the event of her mother's death, and 25-year-old Kit Carruthers (Martin Sheen), a laconic trash collector who transparently wants to pretend he's James Dean. They fall in love, Kit murders Holly's father (Warren Oates) when the old man refuses to accept their relationship, and the couple begin skipping across the northern plains, never too far from the law, killing people as necessary (or not completely necessary), and ending up in the badlands of Montana, and there you have the title. That's tolerably similar to a lot of movies, but Badlands is not at all like the films with which it ostensibly shares a subgenre. Forgive me for returning to Bonnie and Clyde, but it's always struck me as one of the most obvious comparisons to make (the following year's Thieves Like Us is another). Arthur Penn's era-defining crime drama is often accused of glamorising violence, crime, and amorality (charges that I've always sort of agreed with, though I'm not sure it's not missing the point). The same is true for a lot of movies about criminals in those days of the waning counter-culture, massive discontent with society and the government, and so on and so forth - that is, its always been true that American movies tend to ask us to root for the bad guy, but it was a particularly ripe time around the turn of the 1970s for that kind of thing. Badlands does not do that. In fact, this is perhaps the most superficially obvious truth about the movie: it emphatically does not ask or even allow us to view Kit and Holly as folk heroes, or delightfully wicked cads, or noble sinners. There is one reading of the protagonists that Malick allows, and that is as two kids, with far too much romantic imagination and far too little connection to their own humanity; two broken people who are in no way evil, so much as they are detached and disaffected. In no small part, this is accomplished by the tremendous performances Sheen and Spacek give: Malick rarely gets his due as a director of actors, possibly because the acting in his films tends to be wildly stylised, and even then, the leads in Badlands play their parts in a remarkably unconventional register, reminscent (if I am not very much mistaken) of the acting in a Robert Bresson movie. What is first and most prominently notable about both actors is the uniform flatness of their work, in which every emotion is reduced to the same level of mild disinterest. There are too many examples to try and focus on just one or two, but I'm especially thinking of Spacek's delivery of the omnipresent voice-over - the film is told almost entirely from Holly's perspective, sometime well after the fact - which sounds rather more like the uninflected recital of a child reeling of a passage memorised by rote, than of a young woman recalling the defining period of her life with passion of any sort. That sounds harsh, and I don't mean for it to be: the flatness I'm referring to isn't the mark of poor acting - oh my God, no, the very opposite - or of intentionally undernourished characters, like you get in e.g. Kubrick's 2001: A Space Odyssey. It is the flatness of a particular sort that would become very familiar in Malick's films down through the years, indicative not of dullness but of a trancelike state; the individuals in these movies are visionaries in an exceptionally literal sense. In the particular case of Badlands, one gets the feeling that Kit and Holly are dreaming their way through the narrative, always having the slightly glazed expressions of the newly-awakened sleeper who hasn't quite figured out what is real and what is the last trace of a quickly fading vision, and their muddled, "off" inflections do nothing to dispel that impression (for my money, the incredible, multi-faceted final shot, of clouds floating by from the perspective of an airplane, does even more to solidify Badlands as a dream, though whether it's Holly's, Malick's, or anyone else's is more than I can say). It wouldn't be until 2005's The New World that the filmmaker would return to this register of cinema-as-dreaming to anything like this degree; but that is of course a good way in the future from where we are now, and to the viewer in 1973, unable to see the future curves of Malick's career, Badlands must have seemed quite singular - nor does it, in truth, feel old hat even today; films with this kind of impressionistic abstraction are still terrifically uncommon, except insofar as they've become Malick's trademark. Oh, I went and used the i-word! Look out, or I'll say "poetic" next. Seriously, though, discussing any of the director's films and Badlands in particular without allowing oneself to call them "impressionistic" is like fighting with one arm tied behind your back and the other cut off; when a tool that precise and perfect is available, you use it, even if everyone before you has done the same; there's a reason for it. So: impressionism. "The depiction (as in literature) of scene, emotion or character by details intended to achieve a vividness or effectiveness more by evoking subjective and sensory impressions than by recreating an objective reality", says Merriam-Webster, and if that doesn't describe Badlands as perfectly as any phrase could, then I don't know what. There are quite a few subjective and sensory impressions that get evoked as the movie drifts along its unhurried way, none more significant or iconic than the landscape photography crafted by three different cinematographers, Brian Probyn, Tak Fujimoto, and Stevan Larner. This is incredibly beautiful, of course (you may have heard that Malick movies are famous for their landscapes), but it's not just beautiful; one could argue that the whole meaning of the film is contained in how the exteriors are shot. Badlands is structured in four parts, two sets of two: first comes a "domestic" sequence of interiors, ending with Kit's murder of Holly's father; this leads into a "pastoral" sequence, in which Kit and Holly set up a tree house far away from civilisation, and live the life of idealised savages. Another act of violence kicks us into the same pattern: interiors, domestic life, scrounging around where people live, and then another protracted sequence of just Kit and Holly out in the wild; though instead of the verdant greens of the wood, they are this second time in the titular badlands, driving across an endless expanse of dusty, desert plains. The exterior photography in this film is dominated by horizontal lines; the horizon itself, spectacularly exploited in the fourth sequence and in the latter half of the second sequence; the contrast in colors between the blue sky and the brown earth is pushed to draw as much attention as possible to that contrast and thus to the wide rectangular shapes created thereby. The result is that the movie is tremendously easy to look at: as an animal, we're "meant" to look at rectangles and vistas - consider the position of our eyes - with bright colors and little clutter to get in the way of our seeing exactly what we're supposed to see. The interiors, for their part, are cluttered and lack any particular framing discipline - I mean to say, any overarching discipline, every individual composition is precise and deliberate. You don't need a degree in art theory to get the point: there is a perfection to the shape of nature not found in humans. The fact that Kit and Holly, broken people both, force a vertical element onto the exteriors is surely not incidental. Indeed, the bulk of the second sequence is the only violation of the horizontal aesthetic of interiors in the whole movie: by building in a tree, the characters enforce their own vertical-ness onto the landscape; yet it's not chaotic, like it is in the interiors, but rather the only successful marriage of human and natural iconography to be found within in the film.. The temptation to run to the simplest, most reductive readings of this is hard to resist, and the movie is much subtler and more sophisticated than "living in nature is good! living in houses is bad!" - for we never do lose sight of how psychologically empty our two main characters are and remain (contrast this with The Thin Red Line, in which the character most in-tune with the natural world are the most psychologically robust; this is in fact part of why I prefer Badlands of all Malick's features, that it has such an unresolved tension at its heart). The second sequence also makes for a convenient place, if a brutally awkward segue, to mention one of the other great characteristics of Malick's cinema that sprung forth fully-formed: his use of music. In this case, it's a little bit of Satie, an unfortunately heavy-handed use of Nat King Cole's recording of "A Blossom Fell" (the one truly ungraceful moment in the film, with the line "The dream has ended, for true love died" given much too prominent framing by the visual editing), and most famously, the use of several pieces from the "Musica Poetica" pieces from the Orff Schulwerk, composed by Carl Orff and Gunild Keetman; in particular, the multiple appearances of "Gassenhauer", a short rhythmic piece for xylophone, have forever yoked that piece of music to Badlands. The Schulwerk pieces and the Satie are both entirely contrary to what we might expect from a languid piece of Americana set in the northern plains, with two aimless, uneducated protagonists: it's very moody music, unambiguously European, jagged modernism interrupting the flow of sublime landscapes. Even better, the Schulwerk pieces are self-consciously primitive, and relentlessly spare: the series was conceived as a way of teaching the structure and performance of music using the simplest possible melodies. Which makes it, in its fashion, the best possible accompaniment to the story of these two young people who are trying to feel their way about, blindly, into who they are and what they are doing on this planet. The use of "Gassenhauer" to accompany the sequence in the woods is unconventional, even jarring; but the insistent simplicity of the music, combined with the sweet pastoralism of the imagery, could not be more perfect. This is a moment of bliss, but it is a moment of bliss that is artificially created from the juxtaposition of irreconcilable forces. And it thus matches perfectly with these two wholly artificial characters, so divorced from real feeling that they can only think of themselves as figures in a story, or myth: Kit by playing the part of a movie gangster, Holly by sacrificing her actual experience to the literary framing of her narration. It is a surprise, maybe, that such an emotionally intuitive, elliptical movie, drenched in a heavily sentimental affection for the American West, should be so powerfully anti-Romantic about its anti-heroes, but then, Malick's films, for all their infatuation with the poetic and the sublime, always manage to dodge around Romanticism, and in this respect Badlands merely prefigures what was yet to come.